Where will a H+ attack on 6-hydroxyhexan-2-one? 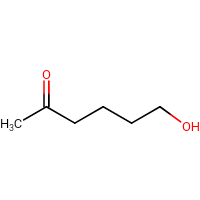 Protonation can take place either on the ketone or the alcohol. So where will it attack? In short, on which of the two oxygen atoms is electron density higher? Browse other questions tagged organic-chemistry reaction-mechanism alcohols reactivity electronegativity or ask your own question. Why does RCN attack the benzene ring in Hoesch Reaction? By which mechanism would azide react with alcohols or alkyl halides? Why can't the electrophile attack the chlorine atom in a halobenzene? How to identify whether an electrophile will attack benzene ring when a deactivating group is attached to it? From where does nucleophile attack the ketone in a nucleophilic addition reaction ?